Hard work and dedication pays off for Durham Attack 15U Red. Congratulations Girls for winning Gold Division 2 Tier 1 at Provincial Championships!!! 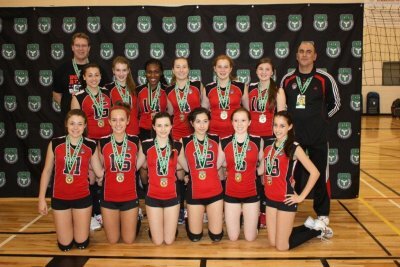 February 24, 2012 – DA Girls 15U Red Wins Silver at McGregor Cup in Peterborough! The Durham Attack 15U Red team, ranked 4th, started the day strong, defeating the Clarington Grizzlies and the Port Perry Panthers two straight games. They continued to play hard and split a two game match against the Durham Attack 14U Heat, to place second in regular pool play. Then it was off to the important cross over game against Peterborough Thunder. Winning this match would guarantee DA Red a spot in a medal game. The girls again came out strong and won both games 25-18 and 25-20. They were off to the semi-finals facing Phenix whom were ranked 1st in the tournament. The Phenix team were definitely out to defend their 1st place ranking, pushing DA Red hard in a point for point first game. Spectators and fans were sitting on the edge of their seats for this match. However, Phenix took the first game winning 26-24. The second game started off much the same as the first and had the spectators in awe. This time DA Red would take the game 25-23, forcing a 3rd game. Hearts were racing and again the girls gave their spectators quite a show pulling off an important game win 15-11. It was off to the gold medal match. The Ottawa Fusion, ranked 2nd in the tournament, proposed a challenge for the girls. Fusion would take the first game 25-15. DA Red fought back and was trying for a win to force a 3rd game. This, however, was not how the day would end. The Ottawa Fusion would take the second game 25-23 and although, the girls played hard, the gold medal would not be theirs for the taking. The girls would take a 2nd place finish and would be leaving Peterborough with a Silver medal. The girls worked extremely hard this tournament and should be very pleased. 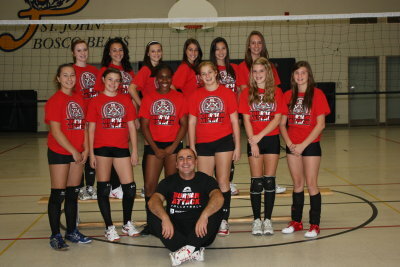 They still have one more 15U tournament before heading to Kitchener in April for the Ontario Provincial Volleyball Championships. We look forward to the upcoming tournaments. Keep reaching for Gold Girls!